Shao bing is a flaky, round baked bread topped with sesame seeds, usually eaten as a breakfast or snack accompanied with soymilk or tea. It comes with a variety of sweet and savory fillings including red bean paste, black sesame paste, mung bean paste, meat or plain. 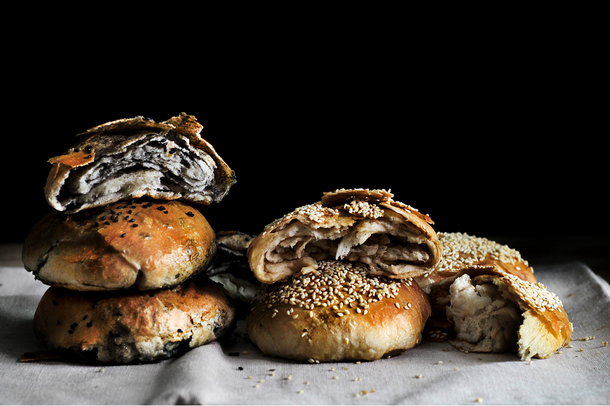 Different types of shao bing are often associated with certain cities and towns. Liu Ji, a famous scholar from the Ming Dynasty, wrote a song titled “Shaobing Song” or the “Pancake Poem” (燒餅歌) to the Hongwu Emperor. Because it is written in cryptic form, its meaning is hard to decipher, but it is believed that certain lines contain references to the future of China. Because most of the predictions since 1911 have been vague and inaccurate, some experts believe the work to be a hoax of recent production, designed to reassure people of the political climate after the Japanese invasion and rise of Communism. The dough is made from flour, water, yeast, and either sugar or salt. It can be filled with various sweet or salty fillings and then topped with sesame seeds before being baked. Yeast and warm water are mixed together before being combined with flour and salt/sugar. The dough is left to rise in a warm area before being transferred onto a floured surface where it is rolled out. Fillings are spread out on its surface and the dough is rolled and divided into smaller pieces. The dough is twisted standing up to form layers of dough and then balled up. Sesame seeds top each ball of filled dough to cover its top surface before being baked. During the Tang Dynasty, Arab traders would travel between China and the West, spreading their Islamic culture including religion and cuisine. Chinese converts thus became known as the Hui people (Huízú), who are associated with this street food for their historical Islamic influences. The earliest record of shao bing was seen in a Chinese historical text, Zīzhì Tōngjiàn (“Comprehensive Mirror to Aid in Government”), a pioneering reference work in Chinese historiography in the form of a chronicle. The book mentioned several emperors during the Tang Dynasty, including one named Tang Xuan Zhong. He held the throne for the longest reign of the Tang Dynasty; however, he was better known for his love for his imperial concubine Yang Gui Fei 楊貴妃. The story goes that he was so lovestruck by his queen that he neglected his country, which caused people to want to murder her in order to gain back his attention. When the emperor found out, he took the queen to his palace to run away; but on the way there, they both got hungry. Tang Xuan Zhong’s prime minister, Yang Guo Zhong, who was also the elder brother of Yang Gui Fei, bought shao bing for the king. The street food gained popularity among locals once they found out about the emperor’s tasting of their cuisine.